a. ^ För Sverige - I tiden has been adopted by Carl XVI Gustaf as his personal motto. Finnish, Meänkieli, Romani, Sami, and Yiddish. 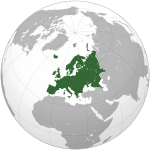 d. ^ Since 3 September 1967.
e. ^ The .eu domain is also used, as it is shared with other European Union member states. 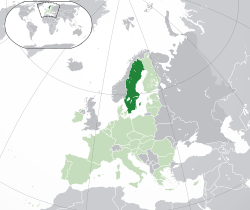 The .nu domain is another commonly used top-level domain ("nu" means "now" in Swedish). Swídìn tabi Sweden je orile-ede ni Europe. ↑ "Befolkningsstatistik". www.scb.se. Retrieved 2009-06-16. ↑ "Summary of Population Statistics 1960 - 2008 (corrected version 2009-05-13)". www.scb.se. 2009-05-13. Retrieved 2009-07-08. ↑ "Befolkningsstatistik". Statistiska centralbyrån. Retrieved 2009-11-11. ↑ 6.0 6.1 6.2 6.3 "Sweden". International Monetary Fund. Retrieved 2009-10-01. ↑ Landes, David (2009-07-01). "Swedish becomes official 'main language'". The Local. thelocal.se. Retrieved 2009-07-15. Àtunṣe ojúewé yi gbẹ̀yìn wáyé ni ọjọ́ 27 Oṣù Kẹ̀sán 2016, ni ago 03:07.